This experimental prosthesis has sensors that communicate touch and movement sensations to the amputee. “It’s amazing,” says Larry Hayes-Richards as he watches the fingers flex on his bionic arm, a feat he’s achieved by just thinking about it. 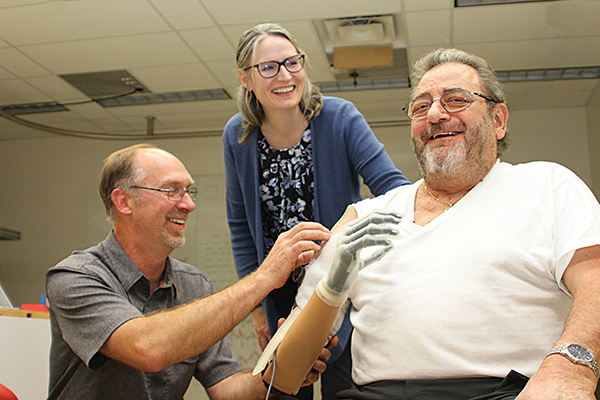 The 72-year-old veteran from Sherwood Park, Alta., is a Canadian pioneer in the use of myoelectric arm prostheses. He is in the Bionic Limbs for Improved Natural Control (BLINC) Lab at the University of Alberta in Edmonton where prosthetist Mike Stobbe and physician Jacqueline Hebert are refitting the socket of his prosthetic arm. What’s amazing is how far the science has come since his right arm was amputated in 2005. He has moved from a prosthesis attached by a body harness to one with a fitted socket that snugs neatly over his stump; from one controlled through shoulder and upper body movement to one operated by flexing muscles in his stump; and to an experimental arm that responds to his thoughts. He has tested out a prototype that “learns” how he moves, making arm motions more fluid and less robotic. And he’s looking forward to test driving a cutting-edge model with fingertip sensors that he hopes will let him feel objects he picks up. A mountain of challenges was overcome to produce myoelectric prostheses controlled by human thought, not least of which was finding out how the brain could communicate with an artificial arm, designing a prosthesis capable of picking up and translating those messages into action, and then figuring out how the amputee and prosthesis could work together. And that’s just the beginning. Both goals required development of surgical techniques: targeted muscle reinnervation (TMR) to help control the prosthesis and targeted sensory reinnervation (TSR) to convey a sense of touch from the prosthesis. All of this was pretty much science fiction when Hayes-Richards joined the Black Watch (Royal Highland Regiment) in the mid-1960s, years before Star Wars popularized the idea of a perfect replacement arm. His eight years of military service gave Hayes-Richards confidence, joy in athletics and a sense of purpose. But it also left him with lifelong health problems from exposure to Agent Orange, post-traumatic stress and moral injuries from deployment to Cyprus, and physical injuries that damaged his joints. That damage required surgeries that set the conditions for a resistant staph infection that ultimately cost him his right arm, full and painless use of his legs and a healthy spine. Amputation is just one of more than a dozen surgeries, including operations to replace elbow and knee joints, and to remove them when they became infected. In 2006, the year after Hayes-Richards lost his arm, the United States Defense Advanced Research Projects Agency (DARPA) set out to develop a brain-controlled prosthetic arm that operates like the real thing. In a decade, a thought-controlled myoelectric arm moved from drawing board to manufacture. These revolutionary prostheses were fitted on the first American veterans in 2017, and now several different models are in development or for sale. As veterans and military are only a small portion of the 100,000 or so arm amputees in North America (and the 10,000 or so in Canada), commercialization will also benefit many thousands of civilians who lost their arms to vascular disease, diabetes, cancer, trauma and infection. Shortly after his amputation, Hebert talked with Hayes-Richards about prostheses operated by human thought, and the surgical technique, pioneered by Todd Kuiken at Northwestern University in Chicago, that makes it possible. Kuiken was looking for volunteers for clinical trials. Hayes-Richards and wildfire ranger Rob Anderson of Grande Prairie, Alta., who lost an arm and a leg in a helicopter crash in 2006, signed up. In 2008, they were the first Canadians to undergo TMR surgery to relocate their truncated arm nerves to enable them to flex muscles to control prostheses specially designed for this purpose. After amputation, the brain still sends out signals to the arm and hand, but the nerves that carry the commands come to a dead end. TMR surgery relocates those nerves to muscles in the upper arm or chest. In a few months, after the nerves grow into the muscle, those muscles respond to the brain’s commands, as though they were moving a hand, wrist, fingers and elbow. When Hayes-Richards thinks “close my hand,” the brain sends a signal down the nerve, activates the corresponding muscle, which produces a small electric signal that is picked up and amplified by the electrodes in the prosthesis and transmitted through a processor to motors controlling the prosthetic hand, which closes. All in the blink of an eye. Hayes-Richards has participated in trials of software that can recognize patterns of nerve signals for a particular motion and be “trained” so the user doesn’t have to continuously think about operating the hand. Pattern-recognition software operates in a similar way as the process humans use when, say, learning to play a musical instrument or master touch typing. At first, we have to think about how to move our hands and fingers, but with practice, we remember the movement and what it is intended to do. The movement becomes second nature and our concentration goes to the music, or the words on the screen, and not on how each finger is moving. Pattern-recognition software duplicates that rote learning, allowing users to “teach” their arms. The software records the way muscles fire to produce a certain movement, and when that firing pattern is recognized again, the software directs the prosthesis to continue the movement, without the user having to think about each step along the way. Although Hayes-Richards has helped test out the new technology, his own arm is not so equipped—yet. The technology has only recently become commercially available in Canada. 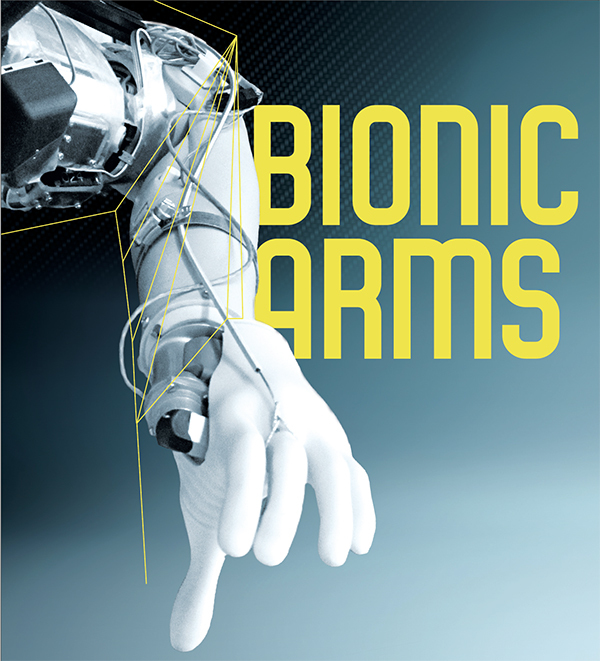 Each new development inches us closer to a prosthesis that looks and behaves like a natural arm. But Hebert doesn’t think we’ll ever reach the Star Wars ideal of an artificial arm that is indistinguishable from the real thing. “But there’s this tipping point where you feel like it is part of you,” she said. We know our natural fingers are part of us because our brain senses where they are and how they move—even in the dark or when we’re not looking at them. This allows us to, say, bring a finger to the tip of our nose in the dark. We know we are responsible for the hand’s movement. Our brain tells it what to do, and we get sensory feedback letting us know the fingers have moved as commanded. We feel the finger touch the skin on our nose. Amputees know they are responsible for how the arm moves, but there is no feedback to tell them its position or how it has moved. It’s much like using any tool—a pencil, a saw, a computer mouse. There’s no feedback; we control it, but it’s not us. Sensory reinnervation helps provide that feedback. In TSR surgery, sensory nerves that used to go from the amputated limb are routed to remaining nerves in the skin of the upper arm or chest; when the skin there is touched, it feels like the (missing) hand is being touched. Researchers can also “turn on” the sense of movement by vibrating the surrounding muscle, which creates a sensation that feels like the phantom fingers and hand are moving. When the amputee simultaneously operates the myoelectric arm, that corresponding feeling is transferred to the action, letting them know they are authors of that action. In trials, amputees were able to make complex grip patterns with their prostheses as well as people using their own limbs, said Hebert. Anderson has compared operating his prosthetic arm—prior to the myoelectric prostheses trial—to using a pair of long pliers. There’s a disconnect between “what you’re physically touching and what your body is doing,” he said in an interview with CBC News. About a quarter of amputees shelve their devices due to residual or phantom limb pain, discomfort, the psychological disconnect. Others prefer the reliable, low-tech devices because the state-of-the-art models don’t suit their lifestyle (they are of limited use to, say, a farmer since the arm’s electronics can’t get wet or dirty) or are frustrating to use because they are not yet advanced enough to duplicate natural movement. Research at Case Western Reserve University in Cleveland, Ohio, has shown that using technology replicating the sense of touch increases the number of days amputees wear their prostheses, and the number of hours in the day. Government health-care plans and private insurers often do not cover, or limit access to, state-of-the-art prostheses. Blame sticker shock and Hollywood hype. “We feel Canadians would be shocked to learn that if you lose a limb, you are not appropriately covered…for the artificial limbs needed to restore functionality,” said Alexis McConachie, communications and case manager with The War Amps. For civilians, the difference between what is covered and what is needed can range from a few hundred dollars to as much as $80,000. A DARPA-funded upper-limb prostheses is called Life Under Kinetic Evolution, forming the acronym LUKE in reference to Star Wars hero Luke Skywalker, whose arm is lopped off by the villain and replaced by a prosthesis that looks and functions exactly as the human original. LUKE has powered joints, including a shoulder joint that allows amputees to grasp objects over their heads, and compound wrist action that lets them keep their hand level. Its fingers have multiple grip patterns, to better conform to the shapes of objects. It has limited tactile feedback. And it costs about US$150,000. Even if more units are sold and technological advances, such as 3D printing, bring down manufacturing costs, myoelectric prostheses are all tailor-made for each amputee, and thus are pricey. Insurers and benefit plans have tried to control their costs by instituting caps on what is provided—a percentage of the price, or a limit on the type of prosthetic covered, or the number and timing of replacements. Myoelectric prostheses are often excluded from coverage. Some plans provide only one limb for life, although “on average, an amputee requires a new prosthesis every three to five years,” as components age and the body changes, said McConachie. As well, publicity about cutting-edge research, combined with fictional portrayals on television and in movies, have created a perception that prosthetic limbs are capable of more than they really can do. Although even top-of-the-line prostheses cannot come close to replicating the functionality of a human hand, insurers will often approve only “basic limbs,’’ such as a body-operated arm with a pincer-like split hook. That’s a long way from the dexterity necessary for easily doing such basic things as tying shoelaces or buttoning shirts. Aside from immediately improving quality of life, a prosthesis reduces incidence of other medical conditions that can develop after amputation. U.S. research recently showed that amputee’s without prosthetic arms overburden their intact arm, causing overuse injuries. Such injuries include osteoarthritis, tendinitis, strains and stress fractures. Use of appropriate prostheses reduces care costs, thus lowering demand on the health-care system. “It’s good economics,” said McConachie. Still, a study by the U.S. Department of Veterans Affairs estimates the lifetime cost of prostheses for a single arm amputee from the wars in Iraq or Afghanistan at US$823,299. “Although the upfront cost is high, artificial limbs are not luxury items,” said McConachie. 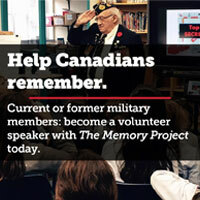 Between 2013 and 2018, Veterans Affairs Canada has provided 35 veterans with prostheses, at a total cost of $617,000. There are no limits on the price of prostheses, said Emily Gauthier of VAC communications-media relations. Veterans with service-related amputations are eligible for a primary device for everyday use, a back-up limb, activity-specific devices for daily living activities (like showering) and devices allowing veterans “to participate in meaningful activities of interest such as sports, recreational activities, hobbies, etc.” The devices are initially prescribed by physicians or specialists. VAC covers the cost of repair and replacements, estimating the lifespan of prosthetic arms at about five years, barring damage or loss. Prosthetist Mike Stobbe, physician Jacqueline Hebert and amputee Larry Hayes-Richards share a laugh during the fitting of a new socket for a prosthetic arm. Hundreds of millions of dollars have been spent developing the high-tech prosthetic arms now being tested—a cost that perhaps could not be justified by the small pool of consumers who would benefit were it not for governments’ commitment to do the best for wounded warriors, and the fact many of the breakthroughs have other civilian and military applications. Innovations for better control of prostheses through brain/machine interfaces, for instance, move along research on technology that could help restore mobility and the sense of touch for people with brain injuries, stroke or paralysis; control robots doing jobs too dangerous for humans, like bomb or landmine disposal; silent communication for the battlefield; or improve virtual-reality experiences for the vast gaming sector or, more soberly, for military training. While Hebert’s team is researching how to incorporate a vibration mechanism into prosthesis sockets to enhance feeling and a sense of embodiment for the amputee, Swedish researchers are developing artificial nerves that will improve the touch sensors in prostheses to not only increase tactile sensation to include texture and pressure, but to communicate that information so the brain recognizes it as such. One surgical technique is being tested that involves wrapping slips of muscle around nerve endings at the amputation site, rather than relocating them, thus reducing the invasiveness of surgery. Another involves grafting opposing muscles around the nerve, so as one contracts, sending a message to the prosthesis, the other stretches, sending a signal to the brain. As a bonus, the muscles emit electrical signals in proportion to the stimulation, which would translate into more intense feelings of position, speed and force and finer movement control for amputees. “Extracting signals is the other major challenge,” said Hebert. Surface electrodes are used now, but on the research horizon are electrodes that can be planted around the nerves, or in the muscle—or the brain. Research is enriching the function of prosthetic arms and hands, too, eventually to provide articulating hands with individual finger motion, more wrist flexibility, and integrating sensory feedback. Researchers in the United Kingdom are integrating machine vision into prosthetic hands. As the user’s prosthetic hand approaches an object, a camera mounted on the wrist feeds information into a computer that assesses how best to grasp an object, then prepares the hand to do so. Techniques for inserting into bones implants to which permanent artificial limbs can be attached are being explored in hopes of increasing feedback between muscles, tendons and the nervous system to improve amputees’ sense of where the limb is in space. Among the challenges are how to get bone and skin to grow into the implant material and developing an airtight seal between the skin and the protruding part of the implant, which is vital for preventing infection. Researchers in the U.S. are 7developing artificial skin for prostheses to enhance tactile sensation and communicate a variety of sensations to the brain. This technology could not only improve the sense of touch for amputees, but be used for wearable sensors to detect things like blood pressure or heart rate. A decade ago, amputee veterans could only dream of prostheses as capable as those available today. Getting to a Star Wars level is going to require pursuing ideas not yet dreamt of.